Bob heads home after a long day of work. He’s looking forward to seeing his kids and spending some time with his wife. He decides to jump onto his email when he gets home. You know, just to check. He sees an “urgent” message from a coworker, and he takes a few minutes to respond. Then another message comes in, and he’s already working, so he might as well respond to that one, too. Three hours later, he looks up and realizes that his wife and kids are in bed and he’s missed the entire evening with them. He resolves to look at that “work/life balance” stuff and heads to bed so he can get up early for work. 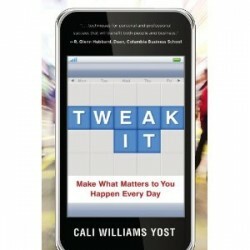 Tweak It is the antidote for that guy (and the rest of us). Read on for more good info on work+life. When you’re in the throes of a work/life mess, it seems like everyone around you has it all figured out. Cali throws out a comforting number of “10-15%” with regard to those who are happy with their own work/life. The other 85-90% (AKA most of us) are still trying to find the right steps to take to make everything work in harmony. Next time you have a moment of panic, take a moment to remember that nine out of ten people feel just like you. The “tweak it” method is fairly simple. First you get started. Then you pick a “tweak of the week” to focus on. Then you review and revise your plan and start it all over again. A few other quick “tweak it” moments that I particularly agree with: younger workers need to take speaking/writing courses (desperately) and older workers need to take time to sit back and remember why they made their career choice in the first place. That’s a great way to rejuvenate the spirit and reignite the passion deep inside. I just wanted to take a second to talk about my own approach to work+life, because it might offer some insights for those looking to make their own changes. I use various tools for flexible work, but I also have a philosphy that helps with the time management side of things. I try to tie as many interests together as feasibly possible. It doesn’t always work and I can’t always make things fit like I’d prefer, but in many cases I am able to satisfy multiple needs with fewer overall actions. For instance, when I run into a crazy situation at work, I will share it on the blog. It doesn’t really require me to create a new idea, but it helps to tie my work and online worlds closer together. Or maybe it’s time to hang out with the kids. I sit with them on the couch and read a book to review on the blog while they read their books or watch cartoons. I’m there and quickly available if needed, but I’m also working and making myself better. The last way is with book reviews like this one. I read many books to review here, but I also know that I will glean ideas and concepts to help me be better at my work as well. Those are just a few ways that plays out, but it’s served me well thus far and I never feel like any part of what I do is truly out of “balance” with the others. However, I am vigilant, because I know all to well how easily things can quickly fall to pieces without constant attention. The bottom line: we all run into work+life issues at some point in our lives. If you’ve ever had the thought that you can manage your work and life in a better way, this book is for you. If you’re interested, click here to get your copy. Thanks to Cali and her team for providing a review copy! This book focuses on strategies for tweaking your current work+life setup to allow you to get things accomplished at work and home without stressing you out or forcing you to give up your dreams. This entry was posted in General and tagged Book Review, ROWE on January 8, 2013 by Ben.